The long-awaited third season of Transformers Animated is finally available on DVD! 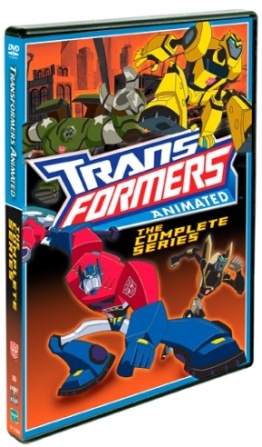 Fans of the popular Transformers classic animated adventures can relive the excitement and action of Optimus Prime and his team of Autobots through the complete Transformers Animated series, including the never-before-released Season Three DVD, in one exciting home entertainment collection. From 2007-2009, Transformers fans and kids were introduced to this high-octane action adventure series, which chronicles the brave Autobots as they seek to protect the Allspark, their new adopted home Earth and their human friends from the Earth-bound super villains. On June 10, 2014, Shout! Factory Kids, in collaboration with Hasbro Studios, has released Transformers Animated: The Complete Series on home entertainment shelves. This highly anticipated complete series box set, featuring all 42 entertaining episodes with special bonus content, finally arrives exclusively to Amazon.com in a collectible 6-DVD box set. Whether reliving the childhood memory or discovering this series for the first time, this collectible DVD set is a must-have for collectors and fans to complete their TRANSFORMERS home entertainment library. As a child I did like Transformers cartoons but that was back in the 1980's so I was interested in seeing this cartoon . It is very well done and I was a little bit entertained but it isn't something I would watch again in the future . Not sure if those die hard Transformers fans will enjoy it better than I did but I think children will enjoy this more so I am planning on giving this to one of my nephews because I know he will enjoy it more than I did. It is good but I found it is just not for me. If you have a child who loves Transformers cartoons they will most likely enjoy this one. It makes a great holiday gift.